What: Stop Drop offers an innovative technological approach that differentiates it from competing products. Others offer a myriad of potentially confusing sensor variants for packages of different weights, and that do not correspond to most shipping companies' packing requirements. Instead, Stop Drop simplifies the selection process for consumers by offering a single sensor calibration. Why: We believe this approach simultaneously offers our customers a straightforward experience and provides them with the most recourse if filing an insurance claim becomes necessary. The reason for this is that the majority of carriers do not provide different handling guidelines for shipments of different weights, at least within the weight range of most packaged consumer shipments (less than 70lbs). Instead, many simply publish packaging "best practices," which stipulate that your parcel must be protected such that it can withstand a drop from approximately 30 inches while in their possession. Thirty inches isn't merely an arbitrary number they arrived at by happenstance. It corresponds with the drop test height referenced in several of the International Safe Transit Authority's (ISTA) uniform test procedures for packaged products. Many companies reference the ISTA's procedures directly, or have contracted with them to create their own similar guidelines (Details). Why is this important? Because it's the only handling "guarantee" provided by most carriers! 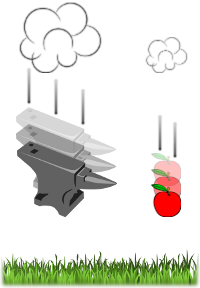 If your items are damaged, it's imperative that you know if that commitment has been breached, and in addition to indicating when it happened, that's precisely the function Stop Drop serves. How: You may ask yourself, "How does Stop Drop accurately detect a drop from the same height for packages of significantly different weights?" Enter Galileo ... Remember that the acceleration of gravity is constant for all objects (excluding air resistance), regardless of weight. On Earth, that corresponds to a rate of 9.8m/s/s. A fall from 30 inches would therefore take your package ~0.4 seconds, after which it would be travelling at just under 5mph before striking the ground. Stop Drop utilizes a self-contained inertial sensor calibrated to respond to conditions just beyond that impact deceleration threshold for most box types and package configurations. It operates in a largely isolated environment, so as long as our mounting recommendations are observed, it responds the same way, whether it's attached to a 5lb box or one weighing 50lbs. When: We've established how Stop Drop detects impact events that characterize mishandling, but what good is that information if you don't know when the event occurred? It's very easy for carriers to point the finger elsewhere when it comes time to honor a damage claim, especially if multiple companies are involved (e.g., distributors, forwarders, consolidators, contractors, etc.). Once triggered, Stop Drop enters reporting mode and conveys the elapsed time since impact with an externally-visible, color-encoded flash sequence via its LED. There is a brief pause following each sequence, after which it repeats indefinitely, while incrementing each hour until the battery is exhausted. Each color signifies a place value: Red=Ones, Green=Tens, Blue=Hundreds. For example, a flash code of 1 blue, 2 green, and 3 red would mean that Stop Drop was triggered 123 hours ago. If that was after the shipping company received your package, but before they delivered it, someone has some explaining to do! Who: Everything explained thus far has been leading up to this, the most important part: Knowing when the detected impact occurred makes it possible to determine who mishandled your package so you can ultimately hold them accountable. If you can count to ten, we can tell you "whodunnit" in a matter of seconds. To further simplify the decoding process, our website provides an easy-to-use calculator that converts Stop Drop's flashcode into an impact time and date. If you provide a tracking number, our calculator can also automatically report whether your package was in the shipping company's possession when the mishandling occurred. Stop Drop is the only product in its price range that will detect not only if your package was mishandled, but when, and therefore by whom.